The next part of the adventure meant traveling from Wick down the east coast of Scotland towards our next B&B in Tain. 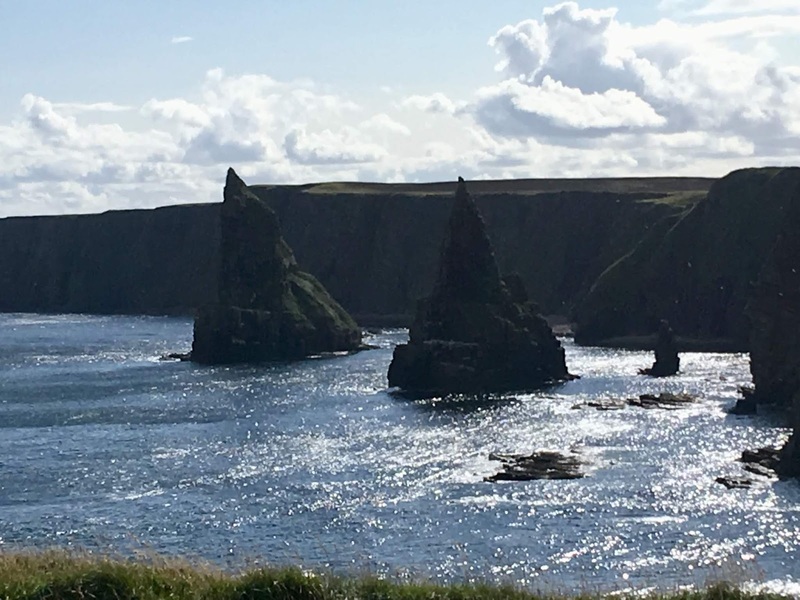 I’d read about Whaligoe Steps on various Scottish travel blogs before we embarked on our NC500 trip, and thought it would be a beautiful spot for us both to visit. Whaligoe Steps is extremely easy to miss from the main road and parking is very limited, but it 100% worth a visit! We must have driven past it around 100 times so make sure you keep your eyes peeled as you do not want to miss this spot. This is such a picturesque spot and I really hope the Scottish weather is on your side when you visit. I can imagine it being quite dangerous to try and tackle the steps if the weather is poor. There are no handrails to hold onto so it definitely isn’t suitable for people with reduced mobility or in wheelchairs. Luckily I was able to make it down to the bottom by holding on to my husband Robert and clinging onto the stones in the wall. I’m really glad I did make it down as it really is one of the most peaceful places I have visited. I could have sat there for hours just reflecting with my own thoughts. There was only one other American couple down there exploring so it was very quiet. Robert decided to climb down into the cove to explore the caves, however, I knew there was no way I’d be able to get down there and if I did then I would have a right nightmare trying to climb back up. I was happy just to sit and watch the others explore, and watch the jellyfish floating along in the sea. After climbing back up all 365 steps (I take my hat off to the fisherwoman, who used to haul buckets of the catch up those steps) we decided to head back on the road toward Dunrobin Castle. I had seen photos of the castle before embarking on our road trip and knew that I wanted to see it in person as it looks just like a Disney castle to me. Dunrobin resembles a French chateau and is still inhabited to this day by the Dukes of Sutherland. It has the most impressive gardens which overlook the Moray Firth (famous for its sighting of dolphins and whales). 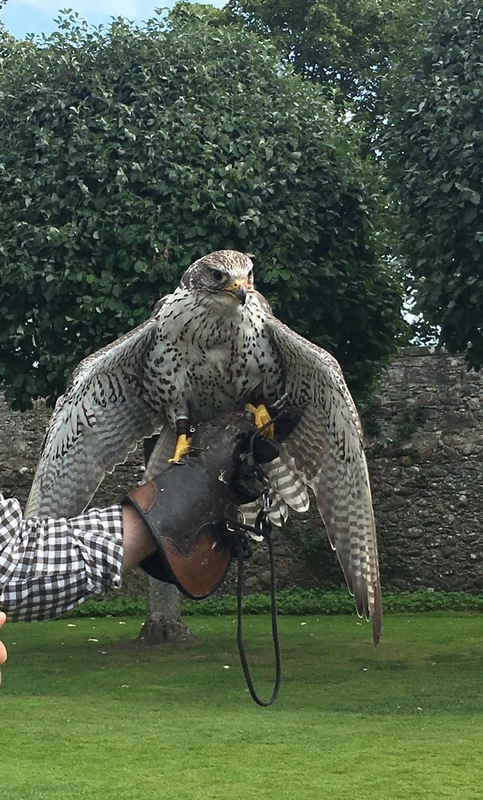 The main reason we wanted to come here is that we had heard that there was a fantastic Falconry display, and the reviews were not wrong. The handler was extremely passionate about his birds and it was a fantastic display. He flew the birds right through the crowds and definitely knew how to keep a crowd captivated. Once the display was finished you are able to view all of the birds in their enclosures at the back of the gardens. As we had time before we needed to leave for our ongoing journey to Tain we decided to explore the inside of Dunrobin Castle. Inside is preserved extremely well and is like stepping back in time. If you are interested in history and how the Duke and Duchess lived their life day to day then I recommend visiting. Once in Tain, we found our B&B for the night - which was nice and comfortable and walking distance into the centre so we were able to walk to the nearest Indian restaurant for dinner and drinks. Thank you for coming along with us on our North Coast adventure. Someone must have told Scotland it’s summer after all, as we woke up to sunshine this morning! The first stop for the day was the Castle of Mey, this is the only residence that HRH Elizabeth, The Queen Mother, owned in her own right. She fell in love with the property shortly after King George VI died, whilst visiting some friends in Thurso. You have a timed tour included in your ticket price so we wandered around the Victorian Walled Garden in the grounds whilst we waited for our allocated time slot. We didn’t have long to wait until our time slot, so we made our way to the castle entrance to be greeted by our tour guide, Jane. The tour takes approximately one hour and if you do decide to visit the Castle of Mey, I hope Jane is your guide as she is extremely good at her job! She was extremely knowledgeable about The Queen Mother and she definitely made our visit entertaining. Inside the castle, there are various personal items that belonged to The Queen Mother and numerous personal photographs of the Royal family. If you have any interest in the family, you will certainly enjoy the castle! They also have a small petting farm on the grounds, which as a massive animal lover I really enjoyed. They had baby ducks and chicks which were extremely cute, be sure to say hello to Alice the donkey. Once we had finished at the castle, it was time for us to visit the famous John O’ Groats signpost. Having also visited Lands End it’s great to say that I have seen the sign at John O’ Groats however if you visit here I personally feel it’s also worthwhile to make the trip to Duncansby Head and Stacks. 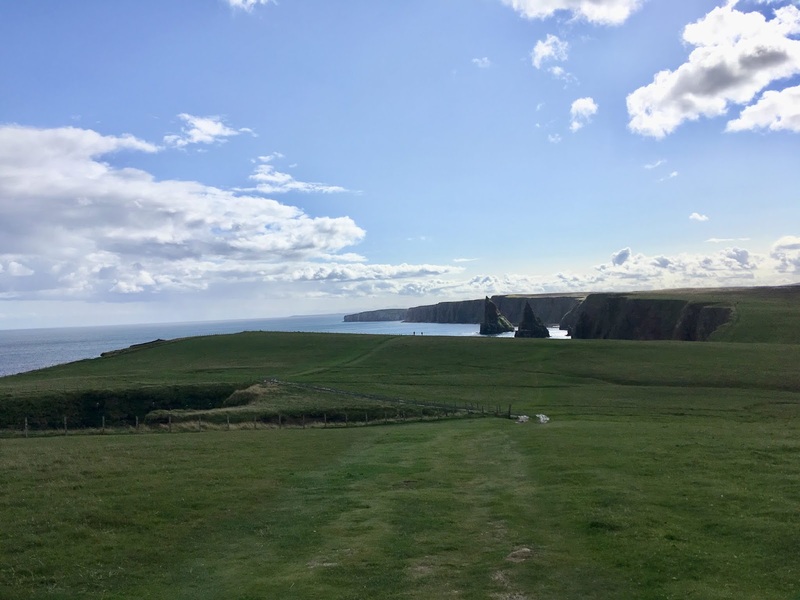 It’s a short walk from the car park at Duncansby head down to the stacks, but one you should definitely make. It’s a fantastic view and for those who love birds, there are numerous sea birds nesting on the sides, unfortunately, we didn’t spy any Puffin. As we were walking back to the car the weather began to change very rapidly, so be prepared for that if you visit Scotland! Luckily we able to run to the car before the downpour started! I know it doesn't seem believable from the photos! Thanks for coming along on our North Coast 500 journey! The views from our accommodation window in the morning were lovely, Castle Varrich in the distance overlooking the loch, definitely beats our usual bedroom views at home! After breakfast, the plan for the day was to travel along the NC500 route as far as Thurso. Then travel along the A9 to Wick were we had accommodation for the night (we had planned to stay in Thurso, but changed at last minute.) The first stop on the route was Strathy Point. Here stands a lighthouse that is pretty much central on the Northern coastline. It’s a fair walk from the car park but there is spectacular views on both sides of the lighthouse across the coastline. I had hoped to see whales or dolphins here, as they are quite a common sight in this area, but unfortunately we didn’t have much luck when it came to spotting them! Once we headed back to the car we decided to carry on further down the coast towards Dunnet. As we were driving we spotted what looked like another beautiful beach with golden sands, so we followed the single track road down to see what it was like. After a lovely walk along the sand dunes we headed back to the car, as I was quite eager to get to Dunnet Bay distillery, which is where Rock Rose Gin is made. The last stop of the day was Dunnets Head which is in actual fact the most northerly point in mainland Britain. Here it is higher up so you have a 360 degree view of the surrounding area, meaning you can also spy the Orkney Isles. Once we’d had enough exploring it was time to head to Wick for some hot food and a hot shower. Someone needs to tell Scotland it’s summer!